The Toshiba C855-1WC notebook is priced just above the £400 mark, and offers a host of features for the relatively low price tag; a 15.6" screen, Intel Core i5 - 3210M 2.5/3.1GHz processor, a 500GB 5400rpm hard drive and 4GB of RAM. Loaded with Microsoft's latest incarnation of Windows - version 8 - and offering USB 3.0 connectivity, this notebook has a lot going for it. Read on for our Toshiba Satellite C855-1WC review. 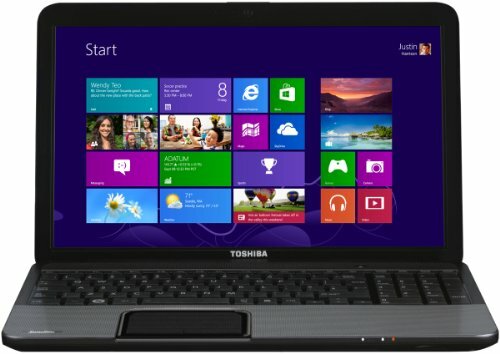 Below is our review of the Toshiba Satellite C855-1WC, a 15.6" laptop, featuring 4GB RAM, 500GB hard drive and Windows 8. The C855-1WC is the latest in Toshiba's satellite range, offering a 15.6" screen and a decent specification for around the £400 mark. It is finished in a dark silver colour, which contrasts with the black to result in a smart and professional, albeit slightly conservative looking laptop. The lid has a glossy dark grey (silver according to Toshiba!) finish, with rounded corners, and looks good - the shiny finish may be prone to collecting finger prints and other marks though, only time will tell. The interior is finished in a similar colour scheme, with a grey surround to the touch pad, and a black keyboard. The keyboard in questions has a nice action, and spans the entire width of the notebook, complete with a full sized number pad squeezed in towards the right hand side. The individual keys are nicely spaced, thus helping reduce the amount of typing errors and accidental key presses. The touch pad, finished in the same black, offers pretty good control over proceedings, with our testers finding it both accurate and easy to use. Processing duties are handled by the popular Intel Core i5 - 3210M 2.5/3.1GHz processor, which is helped by the inclusion of 4GB RAM - this kept multi tasking to a very reasonable speed, and should be able to handle the vast majority of applications users will wish to run. The main connections on this notebook are to the right hand side, which was a nice change from the norm, and makes sense seeing as the majority of users will be right handed. To the right side you will find headphones, microphones, 1 x USB 3.0, 1 x USB 2.0, HDMI, Ethernet and VGA, and to the left is the DVD drive as well as the power socket and remaining USB port. The screen measures the standard 15.6" and offers a decent picture - both colours and detail were displayed accurately and sharp. Operating system duties are handled by the latest version of Windows 8, which loaded and ran fast - none of our testers experienced any issues with this aspect of the notebook. The 500GB hard drive runs at a rate of 5400rpm according to the specification, and offers plenty of storage for your files. Pros: A decent entry level laptop, operating at a decent speed. Cons: None to speak of, especially for the price. If you're looking to buy an entry level laptop, then the Satellite C855-1WC from Toshiba is a good all rounder.